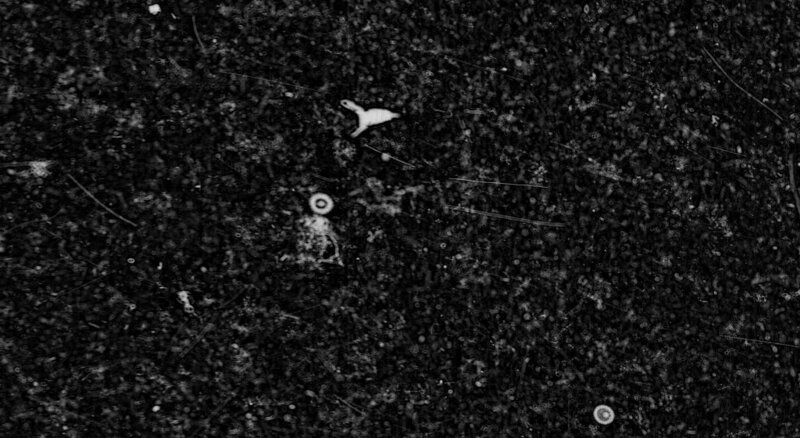 Pteropods are a group of organisms that we’re not focusing on because they are not very abundant in the Plankton Portal dataset. Nevertheless, you may have run across a few of those fascinating little creatures. Pteropod, which means ‘wing-foot’ in Greek, is a group of free-swimming pelagic gastropods (snails). Officially, the word ‘pteropod’ is no longer used in taxonomy; it is a collective term which refers to two clades of gastropods—thecosome (shelled body) and gymnosome (naked body). Pteropods are quite unique because in order to adapt to life in the water column, their foot is modified into two wing-like flippers used for swimming. 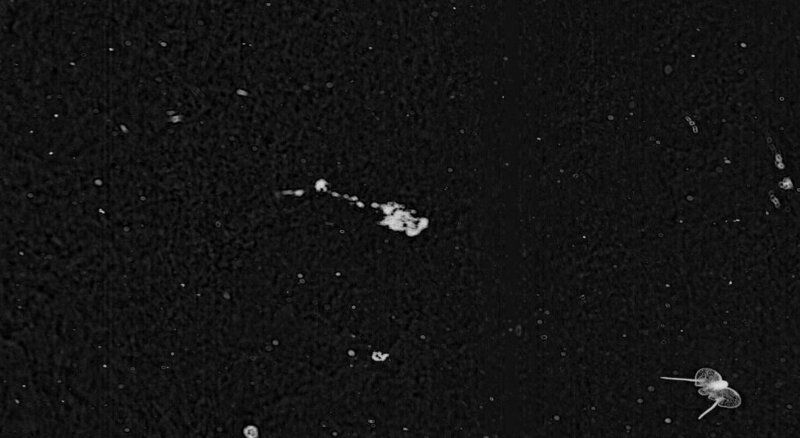 Their body size ranges from a few millimeters to several centimeters – so they’re easily imaged by ISIIS. They can be quite abundant in certain regions of the world’s oceans, and are typically found near surface waters. The first group of pteropods, thecosomes, are also known as the sea butterflies. They have a pair of large ‘wings’ and swims by continually flapping them. Their body is encased in a delicate and translucent shell.The shell can be coiled, needle-like, triangular, and globed. Thecosomes are omnivores. Their diet consists of diatoms, dinoflagellates, and zooplanktons such as copepods, tintinnids, and other gastropod larvae. They capture food by secreting a spherical mucus web several times larger than their body. Scientists believe that the use of the large size mucus web is to capture large, fast swimming prey, such as copepods. The web acts as a filter: particles that are too large for ingestion are removed. During feeding, the mucus web is suspended above the animal while the animal remains motionless below. Ciliary action draws back the web to the mouth and the whole web is ingested. Thecosome reproductive biology is quite unusual. The animal first matures and functions as male. The male pteropod mates with another male and the sperm is stored until the animal changes into a female. When the animal turns into female; its male reproductive organs degenerate. The female lays fertilized floating egg mass that later hatch into swimming larvae (veliger). When a thecosome dies, its shell sinks to the bottom of the sea and forms sediment called pteropod ooze. The shell is composed of aragonite, an unstable form of carbonate mineral. Anthropogenic ocean acidification is one of the challenges that pteropods face. The increase of anthropogenic carbon dioxide level in the atmosphere reduces pH and carbonate ion concentration in the ocean, thus decreasing the calcium carbonate saturation level. As a result, the production of biogenic carbonate becomes more difficult. Overall, they have a hard time secreting their protective shell because of ocean acidification. The second group of pteropods, or gymnosomes, are more commonly known as sea angels. They have much smaller wings which appear as side lobes. They are more robust and lack a shell. Unlike their thecosome relatives, gymnosomes are carnivores. They are active hunters and exclusively prey on thecosome pteropods. A combination of hooks and a toothed radula are employed to extract the flesh from the thecosomes’ shells. The reproductive anatomy of gymnosome pteropods is similar to thecosomes pteropods. The only difference: the male reproductive organs do not degenerate in females. Gymnosomes has two distinct larvae forms. Eggs are hatched into shelled veliger. The veliger metamorphoses into a shell-less polytrochous larvae. The polytrochous larvae are initially wingless and movement is achieve by three ciliary bands. They gradually grow wings and lose the ciliary bands as they become adults. Here is a very nice video about Pteropods. Salps and doliolids (class Thaliacea) are interesting animals because they are in the phylum Chordata, which includes all animals with a notochord during development (e.g., humans, fish, cats), but thaliaceans have a vastly different appearance and feeding strategy compared to most vertebrates. A salp or doliolid body is essentially a giant pumping muscle that forces water through a mucous net filter that collects phytoplankton and is ingested periodically. 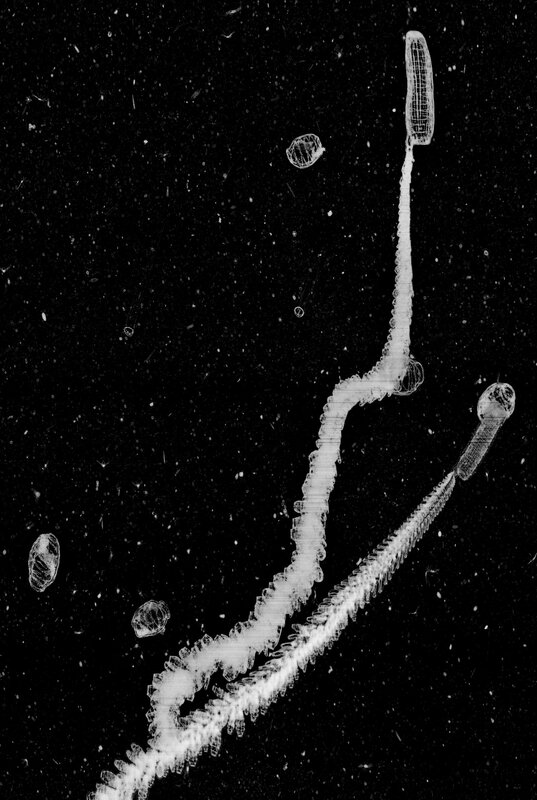 Both groups have limited mobility, with salps using muscular contractions to scoot through the water, while doliolids use tiny beating cilia to propel themselves. The life history of salps and doliolids is remarkable and complex. Similar to plants, their life cycle alternates between sexual and asexual generations. The solitary phase reproduces asexually by budding off clones of itself. On salps, a chain of these clones develops on the solitary animal that is then released and reproduces sexually with other salp chains. The chains first mature as female and then change sexes to become male when they are larger! These chains release small solitary salps that then begin asexual budding once they are a certain size. 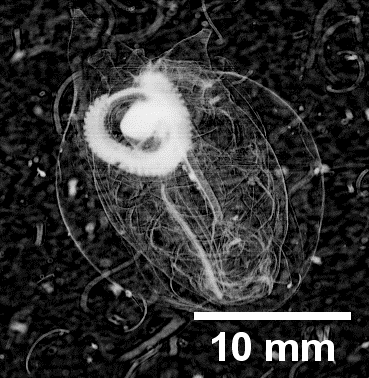 Doliolids on the other hand produce short-lived tadpole larvae that are not seen in salps. When you consider that a chain of salps contains an average of ~28 individuals, it is no surprise that these organisms are capable of extremely fast reproductive rates and can double their populations in hours (Heron 1972). Some scientists think their remarkable reproductive rates can overwhelm other phytoplankton grazers, which could explain the fact that large salp aggregations are often associated with low biomass of other grazers (Alldredge and Madin 1982). Because of their ability to reproduce quickly, salps are often very abundant near steady supplies of phytoplankton, such as at ocean fronts (zones where two water masses with differing physical properties meet) and eddies (Deibel and Paffenhöfer 2009). However, these organisms cannot tolerate extremely dense aggregations of phytoplankton because their mucous filters will become clogged with prey, which severely decreases their feeding efficiency. Salps and doliolids can “bloom” like other jellies, and when these blooms die off the dead salp bodies can export a large amount of carbon into deeper waters. Because of salps and doliolids close evolutionary relationship to vertebrates, scientists are also very interested in their developmental biology. Scientists are trying to use salps as a model organism to study the development of complex nervous systems in all vertebrate animals (Lacalli and Holland 1998). 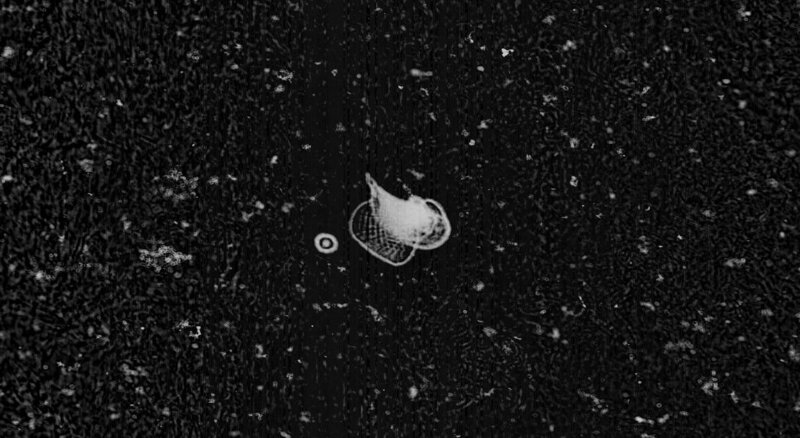 Check out this video from Plankton Chronicles on these remarkable animals! Here is a very funny educational video from the Carthe group (University of Miami). How physical oceanographers study and track currents and why it is important. Very useful data if you want to know where our precious plankton is going! Just watch! funny and instructive.